"The gift that keeps on giving all year!"... and the perfect Christmas bonus! You have found the longest running Jelly of the Month Club in existence! 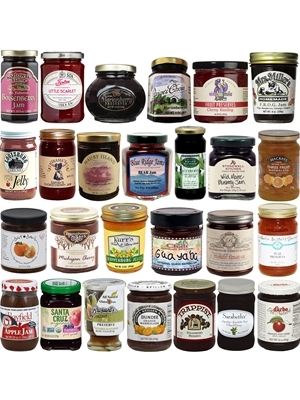 Our Jelly of the Month Club features terrific selections of jellies, jams and preserves delivered monthly. Each month we select hand crafted jars of jelly, jam or fruit preserves for our Jelly of the Month Club from quality producers that you won't find on your local grocer's shelf. Because we have been doing this for so long, we have sampled hundreds if not thousands of items so you can be assured that you are getting the best of the best! Examples of some of the delicious flavors include basics like strawberry, apple, blueberry, blackberry, raspberry and peach as well as more adventurous taste treats like bumbleberry preserves, cranberry/peach marmalade, blackberry guava daiquiri jam, blueberry orange preserves and plum pomegranate jelly. We offer the Jelly of the Month Club in two options: one jar per month or two different jars per month.